Made with only the finest beetroots and carefully selected spices. Beetroot (58%), Sugar, Vinegar, Starch, Salt, Spice. Delicious!!! 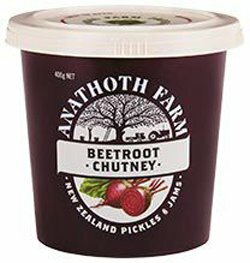 I found this on the grocery shelf at a small grocery in north NZ and am CRAZY about it! It would be good on ice cream!!! So glad I found it on the internet!..good on everything from hamburger/veg burger to sauces. Simple ingredients and simply yummy!